This is a small section of a larger wall which was sprayed by the Lost Souls crew for Upfest 2017. The concept for this wall was for each of the artists to produce a kind of playing card with a character piece on it. Here we have a pairing of SPZero76 and Squirl. SPZero76 has created an incredible skeleton figure, rather disturbingly holding a whole bunch of lollies and sweets. It would seem that he enjoys using these blues and purples in his work, as I have seen them in many many of his pieces. The Squirl piece is also a skeleton but of something altogether different…a horse maybe or perhaps a dog (see the flying bones) but the dentition is all wrong. 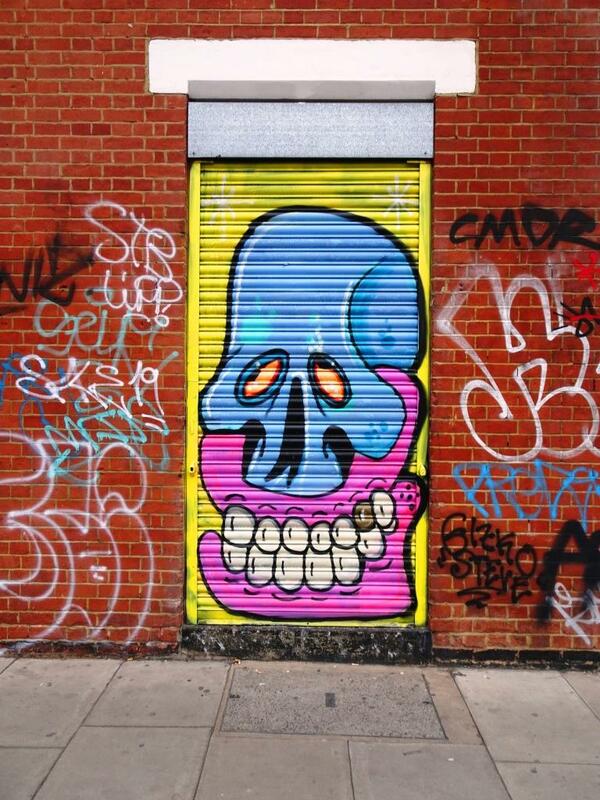 What is it with street artists and death? The horse/dog is interacting with the female skeleton, maybe he wants the sweets. Both of these pieces combine well and are technically beautifully sprayed. More from the Lost Souls to come.